On the 9 March 1947 Dr A.B. Xuma , President of the African National Congress, Dr Yusuf Dadoo President of the Transvaal Indian Congress and Dr G.M. 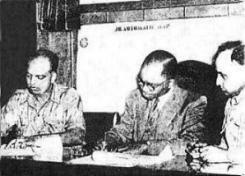 Naicker President of the Natal Indian Congress signed a Joint Declaration of Cooperation. Later the Coloured organization the African People’s Organisation joined the Pact. Mandela wrote in his book Long Walk To Freedom, “…such an agreement was at best tentative for each national group faced problems peculiar to itself. The pass system for example, barely affected Indians or Coloureds. The Ghetto Act, which had prompted the Indian protests barely affected Africans. 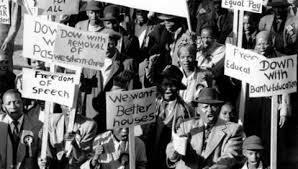 Coloured groups at the time were more concerned about race classification and job reservation, issues that did not affect Africans and Indians to the same degree. But it is interesting to note what preceded this Pact. In 1946 the Natal and Transvaal Indian Congresses mounted a protracted struggle against the Asiatic Land Tenure Bill. Earlier the Congresses were led by a small group of merchants. In a report Sir Shafa’at Ahmed Khan wrote to Gandhiji, “My sole aim in South Africa was to lay the foundation of Indian unity in Natal. I do not think I succeeded completely in my aim but I am inclined to think that the present time would have been impossible but for the dissolution of the Natal Indian Association and the then Natal Indian Congress and the revival of the Natal Indian Congress which you had founded in 1894. This was accomplished on August 29 1943 and since that time there has been only one political organization of Indians in Natal.” This take over by the group led by Dr G.M. Naicker in Natal and Dr Dadoo in the then Transvaal laid the foundation for the Passive Resistance campaign of 1946. This call to boycott all festivities in relation to the visit of His Majesty, drew the attention of Dr Xuma. The Declaration was signed a few months later. The spirit of the declaration and the vision of a broad unity was indeed something that was a goal to work towards. In 1949 briefly this goal was disrupted by the terrible Indo African riots in Durban. A story that was too painful to tell. It was the efforts of the joint leadership that brought an end to these riots. In 1955 the Congress of the People took place bringing all South Africans together to draw up the Freedom Charter, a document which continues to inspire us. In 1985 when an orchestrated attack of Inanda took place, the efforts of the UDF and the Mass Democratic Movement in the country brought peace in Inanda, although only after a lot of bloodshed and acrimony. Today South Africa once more stands at the brink of a crisis. Again racism, xenophobia and unwarranted stirring up of the emotions of the people through generalizations in racial and ethnic terms to arouse victimization and violence is being used. These are forces that can disrupt and destroy the entire country unless checked. The need to once more invoke the letter and the spirit of the Pact is urgent.